Page 15 - Seeking answers? Join the Tom's Hardware community: where nearly two million members share solutions and discuss the latest tech. Amazon has 8700k right now, 12:51 pm pacific. Sounds about right. Stores here sell out of them within a couple of hours at most, and they're not selling golden chips. In the older video the issue is how valid it is to use a high end graphics card and low end graphics settings in games to predict how well a CPU will perform in future games. 2. Test results can be highly skewed by one or two results that differ a lot from the rest. For prediction of the future older games should not be used for calculating the average, but they can be used (cautiously) to investigate the difference between "then" and "now". The new video just show how much the new Assassin's Creed loves more CPU threads, turning four threaded CPUs (like the Core i5-7600K, which was highly recommended for gaming rigs as late as a few months ago) into a slug. Even the new six-core Core i5 gets really busy running the game, leaving no performance headroom for even tougher games in the future. Provided this one game is a good hint of what is to come in the near future, then all Core i5 generation 7 and older will be very short lived in gaming computers from now on. short lived is probably a bit over the top - sure the i5s may not be up there with the i7s like they were in the past, but they wont be irrelevant. Game devs arent stupid - if you want your game to sell, make it run well on an i5. That is the beauty of PCs. You have "minimum" and "recommended" requirements, so you play with your detail levels to reach "playability" to a target platform. I'm far from saying you're incorrect; on the contrary, you're very spot on IMO, but making games that can run on lower end platforms, does not inhibit them from making them run on higher end ones. Now, CPU-wise, I'm not sure many engines can properly handle "cpu settings" very well, other than reducing AI elements and probably other CPU-dependent stuff that might affect gameplay. That would be the interesting topic to dwelve on when talking "how game devs can escale CPUs in games". They will keep pushing the limits of what resources they have available for the sake of their games. We are in a world where 6 and 8 core processors with 12 and 16 threads are mainstream. Game developers will absolutely take advantage of this opportunity, and they are. Gamers, myself included have complained about i5's not quite hacking it in some titles for about 5 years now. Thankfully GPU's have continued to increase in power to allow more longevity. Game stutter is real! And yes you can choose to lower the settings make a game playable, or buy a more expensive GPU. Consumer electronics will always put out hardware to continue to push everyone in an every forward advancing direction. Look we have 4k 144HZ monitors, and 18 core desktop processors! Don't think for a minute that lobbyist are going to petitioning for you to have your quad cores stay relevant! These are all parts in a bigger economic machine that is very demanding! You didn't notice the provision? Given that most games in the near future do require many (logical) CPU cores to run well those with four or less will be short lived. I'm not sure that the majority of games will follow that path any time soon though, even though there are tendencies to "recommend" (older) Core i7 as the "minimum". * Some 15 years ago the first dual core CPUs emerged. It was foretold that games would make good use of the second core, but still games kept running in single threads. * About ten years ago the first quad core CPUs arrived, By this time many games could actually make use of two threads and the prophesy was that even more threads would be used in the near future. * Four (or more) threads have been widely available since, with Core i3 and quad(+) CPUs abundant. Still there are today several games that will use only up to two threads. The most well written software (like Sniper Elite 4) doesn't really care if your CPU has one or 16 cores. It will just make use of whatever computing power there is available (including the GPU) and be happy with it. 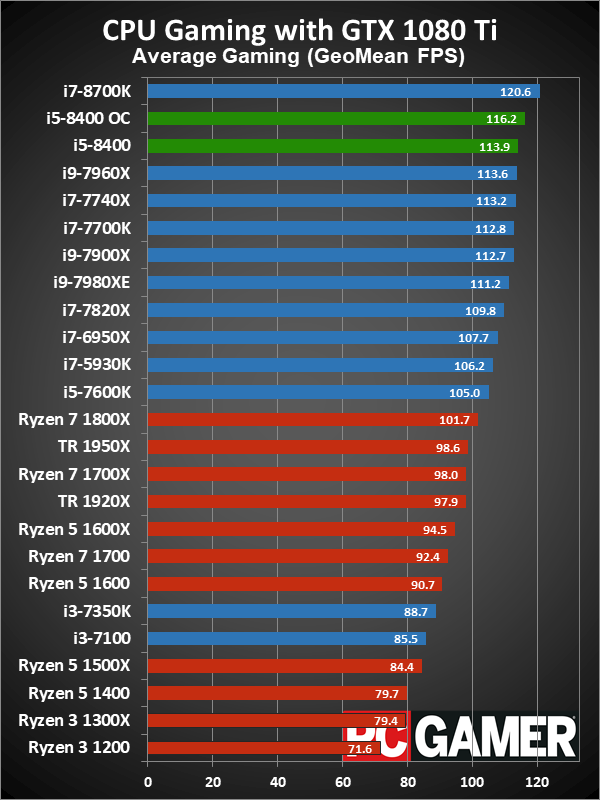 So you are saying that the Core i3 8350K @$190 is awful value for money when is actually on average 31% faster than the Ryzen 5 1500X @$170, and overclocked at single core is actually on average 38% faster than the Ryzen 5 1500X. If we talk more about gaming and the actual raw quad core performance that the i3 is offering, the i3 is the way to go for the ones that can spend a bit more for the extra performance. You'd essentially have to be mad to buy one. You're obsession is based purely around clock speeds & overclocking. in that review they're using a $200 board & a $130 cooler to hit 5ghz. so thats a $500+ cpu/mb/cooler setup for a quad core cpu ?? You think that's good value honestly?? Its a pointless review using those component choices imo. CoffeLake i3 ~ Kabylake i5. I think you have to consider the cost to cool the i3-8350K($190) to reach 5GHz ~$100, and the price of the motherboards that support it the value proposition drops off. 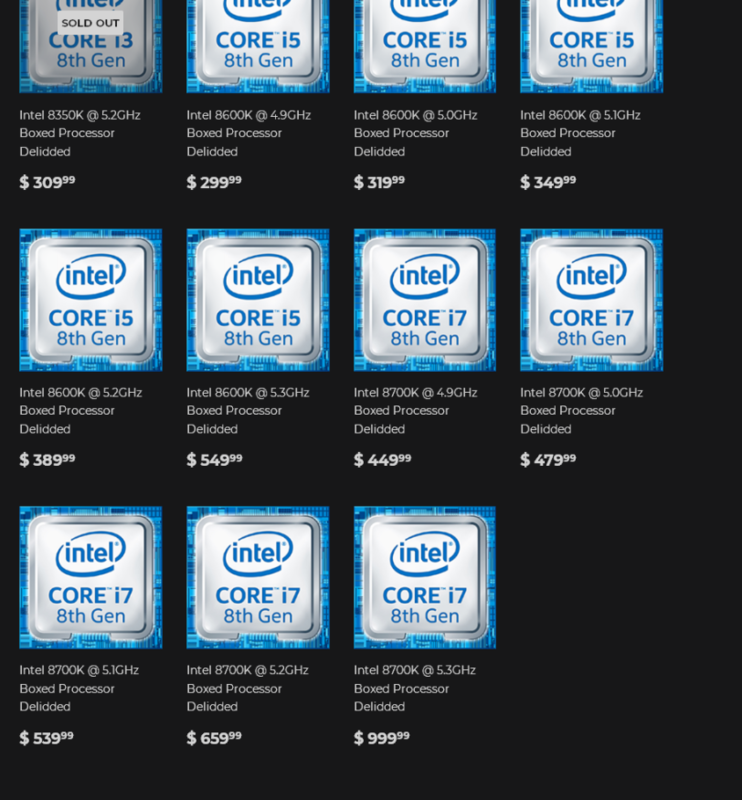 Better off getting the i5-8400($199) from a value point of view right now as well as future proofing just looking at it from the Intel side of things. But value wise that's a lot of money to invest in a world that is increasingly more multi-threaded. It really depends on what you are trying to accomplish when building a PC as too what you want to spend your money on. Are you using a 60HZ monitor? More than stable 60FPS becomes purely academic. Are you using a 1060 video card? If so you will be hard pressed to see a major change in FPS that will change the gaming experience compared to other CPU's this same price segment. On the other side of the fence you have 1600($199) and 1700($299) both comes with a coolers, and cheaper motherboard options. I can't see the i3-8350K beating the i5-8400, 1600, or 1700 when it comes to best bang for your buck considering the extra cost for cooling. If you ask me, the best value of Covfefe Lake is the locked i7. Once the non-Z boards come along, that CPU is going to be the best balance for longevity and current performance. Until Intel releases the B (or H?) boards, mixing "value" and "Covfefe Lake" is not simple. Also, notice in the review how the i3 with 2 less cores, but same "threads" can't keep up with the new i3, even when OC'ed to 4.9Ghz. 4Cores are now the "bare minimum" to get into mainstream gaming and should only be recommended for "budget" builds going forward. Casuals can make do with Pentiums or even A10s (Bristol Ridge APUs) still. 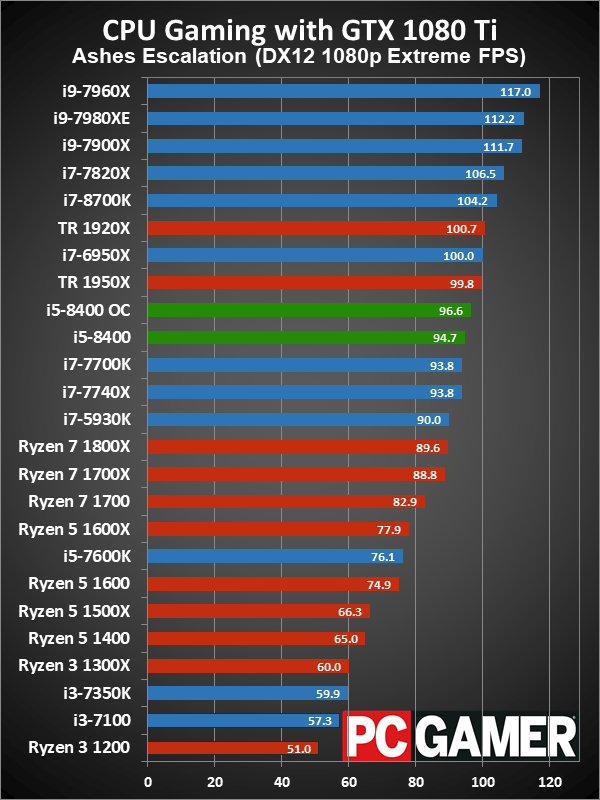 Quad-core i5 (Kabylake) is above all RyZen 7 and TR models. I.e. it is above octo-core and higher core-count Zens. Coffeelake i3 ~ Kabylake i5. Coffeelake i5 and i7 (both six core) are in top positions, but aren't 50% faster than Kabylake i5 and i7, because not all games can use the extra cores, and those few games that can scale up to 18 cores, don't scale linearly. Even in games that can scale to lots of cores, as Ashes Escalation, the older i7-7700k is faster than the R7-1800X with twice the number of cores. I mentioned i3 vs i3 and how they compare to each other with unlocked and locked versions. Like I said, we're talking extra cores and my point is not AMD with 4, 6 or 8 cores, but Intel vs Intel. That is a more apples to apples comparison on the scaling discussion. You cannot deny with the evidence at hand that anything less than 4 cores (not "threads") cannot be recommended going forth for mainstream gaming. Being Intel or AMD is moot to this. A really big percent of people buying new CPU's are actually upgrading, meaning they already have coolers.First of all the K series of processors are aimed to overclockers same with the X for Ryzen. People that argue about having to spend money on a cooler on a K rated processors make no sense to me( is like complaining that Ferrari needs premium gas) I personally have a handful of coolers laying around including liquid coolers, sometimes I give them to friends for free. Same with all the enthusiasts that I know, they all have coolers laying around. When we get together and talk about CPU's I HAVE NEVER HEARD ANYONE COMPLAINING THAT THEY DON'T WANT TO GET A CPU THEY LIKE BECAUSE IT NEEDS A $20 COOLER. I mostly hear these complains from people in forums and reviewers. When discussing "value", having or not having a cooler is indeed an important thing to consider. Since the K series run already high clocks, you don't have much headroom to OC with a cheap cooling solution (same applies to AMD though), so factoring into the cost the cooling solution to your potential OC target is very important. For AMD, ironically enough, since they don't really OC that much more, you won't really need something beefier than the stock one (although, everywhere, they use beefy solutions, but they don't really need one). If you're planning on running a K stock, it's an obvious thing to consider as well and then they lose in the value metric. That is why I mentioned that measuring "value" to the current Intel K line is tricky, since it's dependent on the OC you're looking/aiming for. I personally never hear people complain about getting something better for cheaper! If you have the i5-8400($200) running circles around 8350K(190), and it can do this running on a $30 cooler why would you ever buy the 8350K and a ~$100 cooler? Not everyone has access to your cooler farm(I don't own a single liquid cooler), so it absolutely has to be calculated in the total cost of ownership. I would say every persons circumstances are different, so value will mean different things to different people. I would agree with both parties. Those that are building their first computer will see the value in having a stock cooler. Demand is higher than expected. ^ I don't think demand is any higher than expected at all. I think intel released early (because amd were stealing sales) & never had enough produced or in production in the first place. I agree with Matt, they released 8th gen early to fight off Ryzen sales. It also common tactic in commodities markets to limit supply creating higher demand to raise prices.